Gregor Andréewitch, general manager, Waldorf Astoria Berlin, talks to Breaking Travel News about the luxurious hotel. Not just a star of the Hilton Worldwide portfolio, the hotel is reinvigorating luxury travel in the German capital. Travel broadcaster Phil Blizzard discovers that UMI, one of the trendiest Japanese restaurants in the United Arab Emirates, and chef Yukitaka Kitade have introduced a ‘celestial contemporary’ menu. A gun accidentally went off at the Waldorf Astoria Hotel in New York during a wedding, injuring at least four people, according to reports. 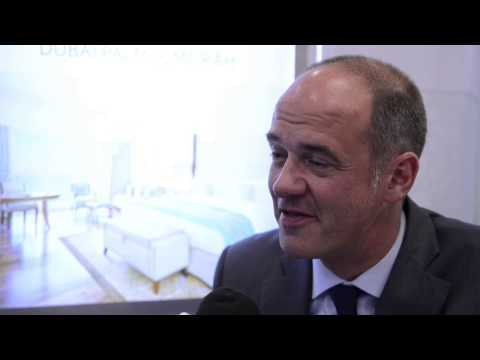 Jan Moenkedieck, Waldorf Astoria Dubai talks to Breaking Travel News at ITB 2015. An invigorated and imaginative new spa has emerged at the legendary Arizona Biltmore, A Waldorf Astoria Resort following a complete makeover that has revamped and repositioned every aspect of the facility. Hilton Worldwide has confirmed it will see the iconic Waldorf Astoria Hotel in New York for $1.95 billion. Chinese insurance first Anbang Insurance Group will take ownership of the property, but the deal will see Hilton continue to operate the hotel on a 100 year lease. The Waldorf Astoria Jerusalem has opened its doors marking the brand’s continuing expansion in iconic landmark destinations across the world. Waldorf Astoria Jerusalem features 226 luxuriously appointed guest rooms and suites spread over ten floors, all of which offer unparalleled comfort and the finest amenities, with many overlooking the spectacular city and park. Waldorf Astoria Hotels & Resorts has unveiled designs and announced the development of a Waldorf Astoria hotel in Beverly Hills. Located adjacent to The Beverly Hilton on the corner of Wilshire and Santa Monica Boulevards in Beverly Hills, the 12-story, 170-room luxury hotel will be the brand’s first new build on the West Coast and will join the Waldorf Astoria portfolio of 24 hotels and resorts. The Waldorf Astoria Beijing has opened its doors marking the second Waldorf Astoria hotel in China and the brand’s continued international expansion. The 176-room property features three unique restaurants, including Peacock Alley, Brasserie 1893 and Zijin Mansion, 796 square meters of function meeting space, a spa and fitness centre with heated indoor swimming pool. Hilton Worldwide announced the expansion of its Waldorf Astoria Hotels & Resorts brand into Latin America with the opening of Waldorf Astoria Panama. Luxury hotel to feature Guerlain Spa as part of £24 million upgrade. Following a significant programme of investment the soon to be re-launched The Caledonian, A Waldorf Astoria Hotel in Edinburgh is pleased to announce the introduction of the UK’s first Guerlain Spa, which will open to guests in winter 2012, following the grand unveiling of the hotel in mid-September.